Utility-scale solar prices fall below $1/watt for first time; capacity expected to triple over next five years. Q1 was the sixth straight quarter in which more than two gigawatts of solar photovoltaics (PV) and more than one gigawatt of utility-scale PV was installed. The residential and non-residential PV markets are both expected to experience year-over-year growth, even as the quarterly numbers saw a drop from last year’s record-setting pace, the report said. The utility-scale segment continues to drive the market, representing more than half of all PV installed during the quarter. Much of the capacity comes from projects that were originally slated for completion in 2016, but ended up being pushed back due to the extension of the federal Investment Tax Credit. And this entire year is expected to benefit from those “spill-over” projects. The non-residential solar market—which includes commercial, industrial and community solar installations—grew 29 percent year-over-year, but was down 39 percent from a record high fourth quarter 2016. The report highlighted Minnesota’s growing community solar market. The state nearly doubled its cumulative community solar deployment in Q1. Several other states not as well known for their solar markets saw particularly large jumps in installations this quarter, including Idaho and Indiana. Meanwhile, emerging state markets such as Utah, Texas and South Carolina continued their growth. 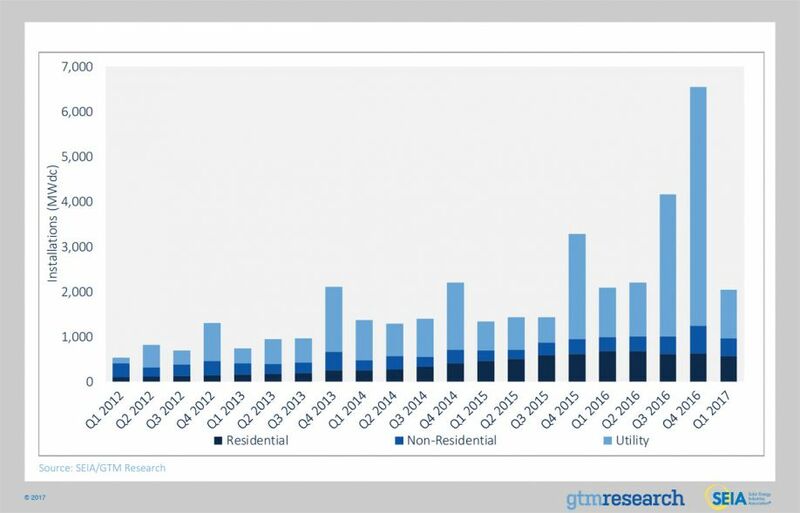 More than a half-gigawatt of residential PV was installed in the quarter, down 17 percent from the first quarter of last year. Part of the slowdown can be attributed to national installers pulling back operations in unprofitable geographies and customer acquisition challenges in more mature residential state markets like California. According to the report, residential PV installations in California will fall year-over-year for the first time this decade. Despite this, California remains the largest state market for residential solar installations. GTM Research forecasts that 12.6 gigawatts will come online in 2017, 10 percent less than 2016’s boom. Total installed U.S. solar PV capacity is expected to nearly triple over the next five years, and by 2022, more than 18 gigawatts of solar PV capacity will be installed annually. However, downside risk looms over the long-term outlook for U.S. solar, due to a new trade dispute initiated by Suniva. According to the report, if Suniva’s petition for a minimum silicon PV module price of 78 cents per watt is successful, it could raise system costs between 13 and 35 percent, depending on segment. While it remains unclear how the International Trade Commission will ultimately rule on this petition by Suniva, the approval of the petition as initially filed would result in substantial downside revisions to the GTM Research forecast across all three segments. In Q1 2017, the U.S. market installed 2,044 MWdc of solar PV. In Q1, solar was the second largest source of new electric generating capacity additions brought on-line, responsible for 30% of new generation, second only to natural gas. Despite accounting for its lowest share of the residential market at 35%, California is still the largest state market for residential PV, though contraction in the state was the primary driver behind the national residential market falling 17% over Q1 2016. Installed system prices continue to drop across all market segments, with fixed-tilt utility-scale systems dipping under the $1/watt barrier for the first time. GTM Research forecasts that 12.6 GWdc of new PV installations will come on-line in 2017, down 10% from a record-breaking 2016. Total installed U.S. solar PV capacity is expected to nearly triple over the next five years. By 2022, more than 18 GW of solar PV capacity will be installed annually. Suniva’s filing of a Section 201 petition to impose trade remedies on foreign-manufactured cells and modules threatens to significantly reduce PV installations across all segments if accepted in its current state. The nuances of this case are detailed in the full report.